A Happy New Year to any visitors as we look into Nessie past and present again. I am an avid collector of Nessie books and naturally the very first publication on Nessie is one that would excite the imagination. Unless someone wishes to correct me, I believe there were four books of varying sizes and depth published on the monster in 1934. I am aware on none being published in 1933. 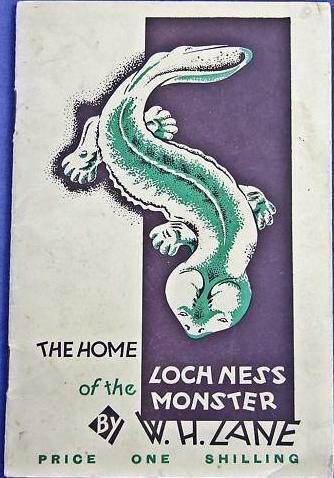 After comparing and contrasting these four books I believe the first was the one entitled The Home of the Loch Ness Monster written by Lieutenant Colonel W. H. Lane and published in March or April 1934. 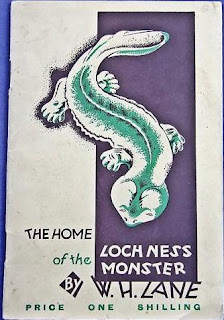 The publication date is not given but a foreword by Mr. Lane is dated 11th March 1934 from his home on the shores of Loch Ness at Tigh-na-Bruach. I published a blog on the author himself previously which you can read here. The cover of the book is shown below. It is a small work of eighteen pages printed by Grant & Murray Limited of Edinburgh in conjunction with the Moray Press. There is one illustration and one map contained therein and there are two themes to the book as the title suggests. One is the monster and the other is its home, Loch Ness. To the first subject, Lane devotes half the pages and puts up a defense of his theory that the creature is a giant salamander. To back up this view from eyewitness testimony he cites the case of a witness to the creature in the River Ness in February 1932 who describes seeing a six to eight foot beast which looked like a crocodile, but had "wicked pig-like eyes" on the top of its head. It had a long jaw and a number of round teeth visible filling the mouth. It was noted, critically to Lane, that it had no neck to speak of and had to half-turn its body when it turned its head. It slowly paddled upstream against the strong spate of the river and swam out of sight. We now know the witness was a Miss K. MacDonald and the matter of short/no neck appearances has happened a number of times in Loch Ness lore. I would not presume to suggest we have two mysterious beasts in Loch Ness but not knowing with any certainty what the monster is leaves such a question very much open. Lane then addresses the supposed long neck and head and examines the Spicer land sighting but asks us to consider that it was the tail and not the neck being observed there and elsewhere since it could not be ascertained with certainty that any eye nose or nostril was visible - which is a reasonable argument given the often breif and distant nature of a typical head and neck sighting. Finally he (unfortunately) uses the now discredited tracks found by Wetherell as a proof since they fit so well with the spoor of the salamander. The second part flows from the first when he asks how such a beast got into the loch and here he moves into his other interest of ancient history. His map puts forth the theory that there was once a grand trunk river that flowed along the great glen and formed tributaries which we now know today as the Tay, Tyne and even Thames and so on. This he believed to have been a pre-glacial feature inhabited by man along its mighty banks. After this he discusses the possible migratory patterns of man and animals as they recolonized the area after the great melt. He adds that the North Sea was once a plain which this river flowed through as men and animals followed its banks back to Scotland. I shall look at the second book on Nessie ever published in a later blog.